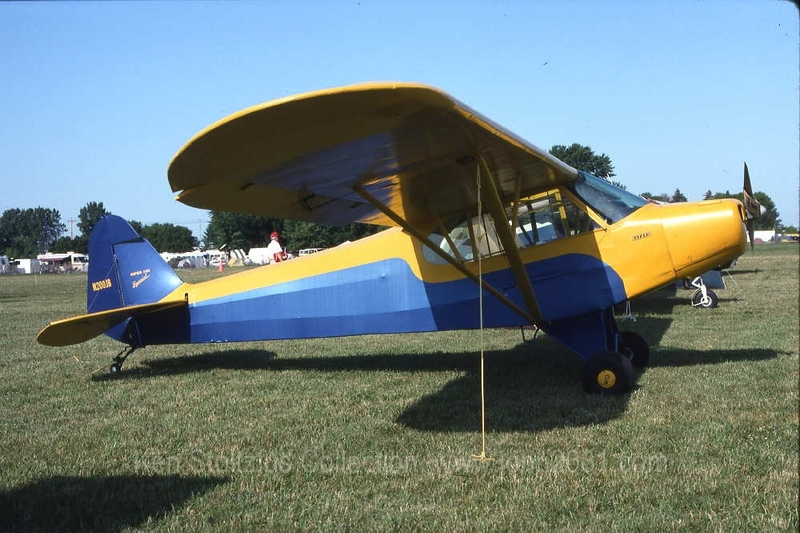 Piper PA-11 Cub Special pictures and information. In years gone by there were two Pipers that I admired in a certain way. 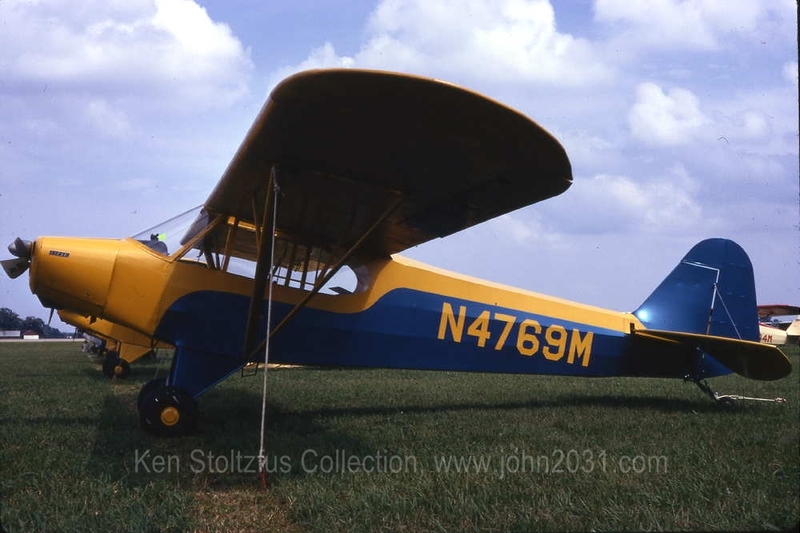 They were the PA-11 Piper Cub Special, a dressed up J-3 Cub, and the PA-14 Family Cruiser, the next step up from the PA-12 Super Cruiser. Neither were made in large quantities and I never flew either, but there was always something sort of special about them. The PA-11 is in TCDS A-691, with the J-3 Cub series, but it has its own serial numbers, beginning with 11-1. 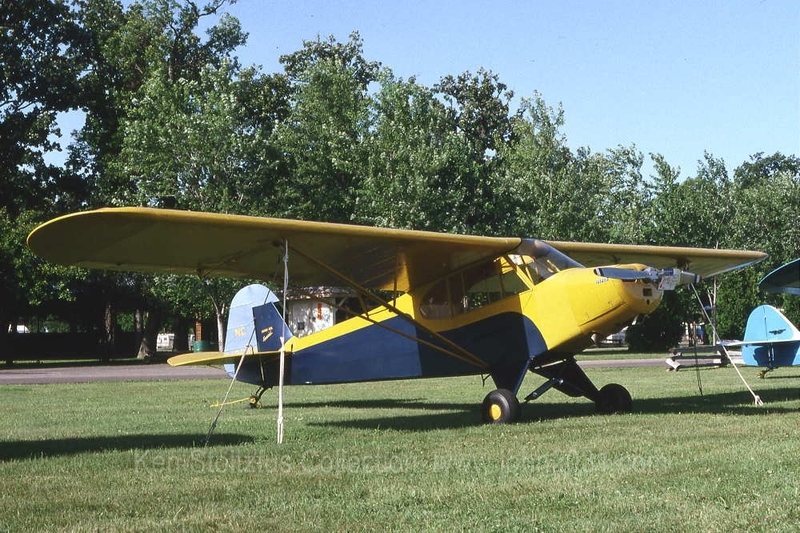 About 1400 were built from late 1947 thru 1950, when they were superceeded by the PA-18 Super Cub. The current FAA register shows almost 550, and there are 90 in Canada. About two years ago I peeked through a crack in the back of an old hangar, and would you believe - there sat a PA-11, in original yellow and blue colors. It looked like it had been there for many years. The TCDS says, "Model PA-11 is generally similar to the J3C-65 except vertical location of engine mount, cowling, forward fuselage structure, types of seats, fuel system (including gas tank location), lift struts, required equipment, and eligibility of certain equipment items, as listed. " The fuel tank was moved up into the wing, and the windshield slopes nearly to the firewall. The seats were moved back, allowing solo from the front. They were available with A-65, and C-90 Continentals. Piper PA-11 N4511M, probably a C-90, at Z41 Lake Hood Strip, Anchorage, AK 4-08. This is how I remember them. Now this is what you call a "beefed up" landing gear! 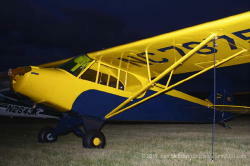 And here's the "Piper Cub Special" logo. Yup! Piper PA-11 N4580M, PA-11S, i.e. built as a seaplane, at PAMR Merrill Field, Anchorage, AK 5-12. I've seen it several times since 7-04. It needs a little help - - hopefully soon! Piper PA-11 N4928H, a pretty PA-11 at PAWS Wasilla, AK 5-10. The angle of the cowling suggests "Lycoming," which probably requires those balanced elevators. 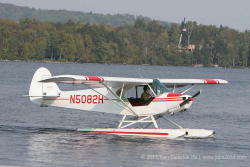 Piper PA-11 N5082H at the 2006 International Seaplane Fly-In at 52B Greenville Seaplane Base, Moosehead Lake, Greenville, ME. Lining up for a takeoff contest with Taylorcraft N6636N; out of the water; slipping her in for landing; and heading back to shore. Piper PA-11 N5575H, a 1949 and probably in original colors at PABV Birchwood, AK 7-04. The later PA-11's were done like this. Piper PA-11 N78635 with balanced elevators and O-235, in the afternoon sun at Z41 Lake Hood Strip 5-10. Note the angle of the nose. 11-1532 Piper PA-11 Cub Special N78758, 1947, in original colors, sans engine at Kenai Airport, Alaska, 5-12. Piper PA-11 N78831 at Z41 Lake Hood Strip, 5-10 - Lousy light but it's a PA-11 so I took it! Aircraft was destroyed 8-10.